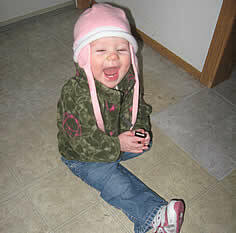 Sara was a very active five-month old when she was tragically diagnosed with Wilms tumor. Having little time to spare, doctors removed the tumor and her right kidney to begin getting Sara back to health. After Sara had recovered from her surgery, the 22 weeks of chemotherapy started. As soon as she heard the news of her daughter's cancer, Sara's mother, Karen, quit her job to be with her little girl. Luckily, Sara went through her chemo treatments with little complications. The NCCS provided gas cards to the family for transportation to and from the hospital so they could be with Sara round the clock. With the help of her doctors, the accurate diagnosis and love of her parents, Sara is now cancer free. She celebrated her first birthday on February 20, 2013 and her parents look forward to 100 more with their little girl.